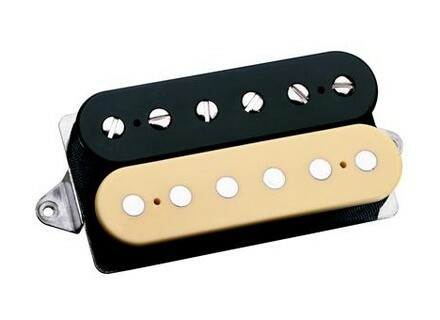 DP223 PAF 36th Anniversary Bridge, Humbucker guitar pickup from DiMarzio in the Vintage Output series. 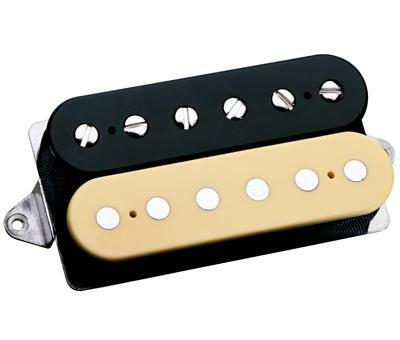 DiMarzio has announced a bridge version of its 36th Anniversary PAF pickup. DiMarzio claims to have used new technology to duplicate the qualities of the most powerful and warm-toned vintage humbuckers without sacrificing the presence and open sound of the originals. The PAF® 36th Anniversary Bridge model claims to gather all the best qualities of the Virtual PAF® bridge and Virtual Hot PAF® pickups and then some. According to the manufacturer, it is as loud as the VHPAF™, but with as much low-end and midrange definition as the VPAF™ bridge model, and with highs that are actually bigger and smoother than either model. Described as "a hotter version of (DiMarzio's) PAF® 36th Anniversary", this pickup is not just for set-neck 24-3/4" scale guitars but was also designed to fit trem-equipped bolt-ons. The PAF® 36th Anniversary Bridge Model in standard spacing is also available with authentic vintage bobbins in glossy black, glossy double cream or glossy black & cream zebra; vintage "Patent Applied For" long-legged nickel-silver base, 1-conductor cable and your choice of polished and plated or vintage worn cover. Recommended for Bridge position, the DP223 can also be used in neck position with hotter bridge models. Luna Guitars Oracle Series - Crane Luna Announces Oracle Series "Crane" Acoustic Guitar. Fender Telecaster Pink Paisley Fender has announced limited edition reissues of its late 1960s Pink Paisley and Blue Flower Telecaster models. Fender Classic Player Jazzmaster Special Fender announces the new Classic Player Jazzmaster Special guitar, a new model aimed at updating Fender's iconic Jazzmaster model with some thoroughly modern improvements, including hotter pickups, a new Adjusto-Matic™ bridge, a 9.5" fingerboard radius and a new neck pocket cut aimed at providing better pitch. The Trem plate was also moved closer to the bridge in order to increase break angle and sustain.